"To provide a perfect blend of luxurious and world-class lifestyle, modern design and peaceful living that is ideal for both living and doing business in one of Karachi’s most desired neighbourhoods." Welcome to the world of AKD Group! It gives me immense pleasure to welcome you to one of Pakistan’s leading business groups. Having grown from humble beginnings to a multi-industry / multi-faceted business group over the last 40 years, we remain steadfast to our founder’s basic philosophy that the customer is our raison d’etre. We at the AKD Group remain a major driving force in Pakistan’s expanding and vibrant real estate market with state-of-the-art offerings across the country. AKD Capital, which is one of the Group’s real estate ventures, was one of the first to have been awarded a Real Estate Investment Trust (REITs) license in Pakistan, vindicating the Group’s leading role in Pakistan’s real estate. With the launch of ‘The Arkadians’ - a landmark housing and commercial project, the AKD Group has added another feather to its cap of various successful business ventures. The Arkadians spans over an area of 43 acres and comprises of 13 premium residential towers, 6 office enclaves and utility spaces - making it one of the largest announced real estate projects in Pakistan. It was my dream to build a project of this kind to provide the people of this country a new concept with the first of its kind in high-rise residential luxury living while maintaining our country’s rich cultural heritage and core values. The concept of the Arkadians will provide the Pakistani people with living standards in line with the world’s best. To us, our customer’s confidence is everything as it underpins our core philosophy. Our commitment to ‘The Arkadians’ is vindicated by the visual display of the first phase of the project's foundation which should continue to strengthen the confidence reposed in us by our customers. At ‘The Arkadians’ we are not settling to meet expectations but to exceed them! I invite you to visit and explore the possibilities you thought were never possible before. I welcome you to share the AKD Group’s vision for the future of world class luxury living. Slated as Pakistan’s tallest residential project, The Arkadians comprises 13 residential towers (32 and 26 storey high), six office enclaves and utility spaces. The orignial master plan of the Arkadians is by ATKINS. Principal contractor services are provided by Creek Developers (Pvt.) 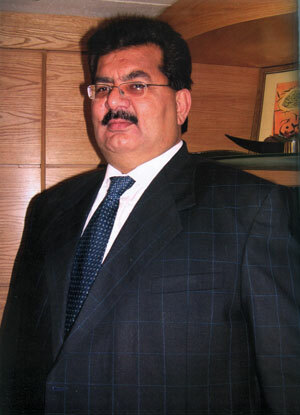 Ltd.
• The Architects-Studio Tariq Hasan: Architect and Project Manager for residential towers. • ARCOP: Architect and Project Manager for office towers. • Habib Fida Ali: Architect and Project Manager for retail. • Naheed Mashooqullah: Interior Designer. • Paragon Constructors: Piling and Construction Contractor for Tower A. • Principal Builders: Construction Contractors for Tower B.